All combination birth control pills contain estrogen (typically ethinyl estradiol) and a progestin. The term progestin is used for any natural or man-made substance that has properties similar to natural progesterone. 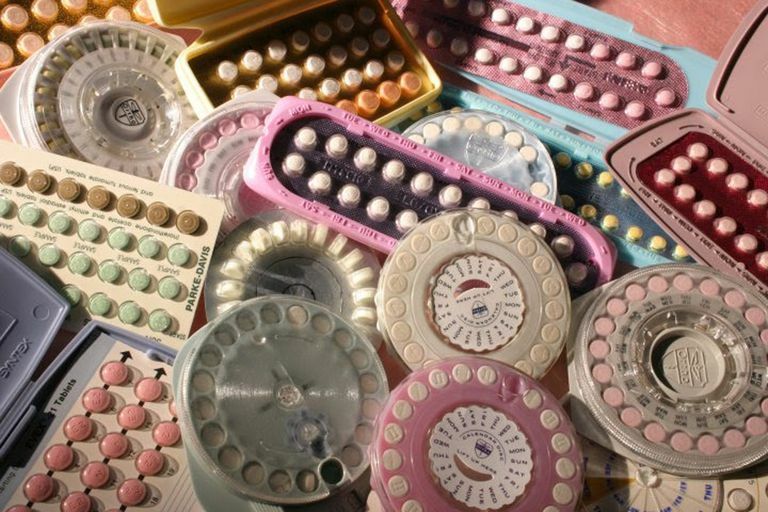 In contrast to estrogen, there are many types of progestin found in various oral contraceptive brands. The older progestin types are usually referred to as first- and second-generation while the newer ones are called third-generation (and fourth). Comparing estrogen is fairly simple since all combination birth control pills use the same type of estrogen; this makes it possible to compare dosages simply by quantity. On the other hand, because pills use different types of progestin (each of which has a different strength), it is much harder to compare progestin levels across pills. The amount of progestin found in birth control pills is fairly small and is usually denoted in milligrams (mg). What this means is that even if two brands have the same progestin dose, they may have different types of progestin, so the potency can vary widely. There are many types of progestins, and each has a different profile in terms of progestational, estrogenic, and androgenic activity and/or effects. The result of these effects is dependent on the combination of the type and level of progestin and the level of estrogen. Because the hormones found in each type of pill are different, and because every woman responds differently to the pill, these general guidelines may not apply to all women. To better understand how a progestin may be classified, it is helpful to clarify what effects a progestin may have on the female body. Progestational Effects: Progestational effects refer to how the progestin stimulates the progesterone receptors (thereby helping to prevent ovulation and to lessen menstrual bleeding). A similar term is progestational selectivity, which is the degree to which progestational effects are maximized and androgenic effects are minimized. Typically, the goal of a birth control pill is to achieve a high level of progestational selectivity. Androgenic Effects: Androgenic effects refer to the likelihood that the progestin may cause unpleasant side effects. Progestins with higher androgenic activity may increase the chances of androgen-related side effects which mainly include acne and hirsutism (female unwanted hair growth). Also, progestins with less androgenic activity tend to have little to no effect on carbohydrate metabolism, which is how the body breakdowns and synthesizes simple sugars into smaller units that can then be used by the body for energy. Estrogenic Effects: Estrogenic activity has to do with ethinyl estradiol, the type of synthetic estrogen found in birth control pills. A higher number of micrograms of ethinyl estradiol lead to more potent estrogenic effects. A higher amount of estrogenic activity helps to decrease androgen-related side effects. However, progestins tend to counter some of the estrogenic effects of ethinyl estradiol. Combination birth control pills include an estrogen and one progestin. There are eight types of progestins. Most of these synthetic progestins are chemical derivatives of testosterone (known as 19-nortestosterone derivatives). The available birth control pills that are classified under 19-nortestosterone can be further divided into two families: estrane and gonane. The estrane family (typically, first generation progestins) consist of norethindrone and other progestins that metabolize to norethindrone. These include norethindrone acetate and ethynodiol diacetate. Second generation progestins, which have varying degrees of androgenic and estrogenic activities. These include levonorgestrel and norgestrel. Newer gonanes, or third generation progestins; these are reported to have the least androgenic effects and include desogestrel and norgestimate. Drospirenone, the last progestin, is also the newest (4th) generation. Drospirenone is a unique progestin as it differs from the others because it is derived from 17a-spirolactone, not from the 19-nortestosterone derivatives. Typically the third (and fourth) generation progestins tend to be highly selective and possess minimal androgenic properties. These include norgestimate, desogestrel, and drospirenone. There has been some evidence to suggest that the third generation progestins may carry a higher risk of blood clots.